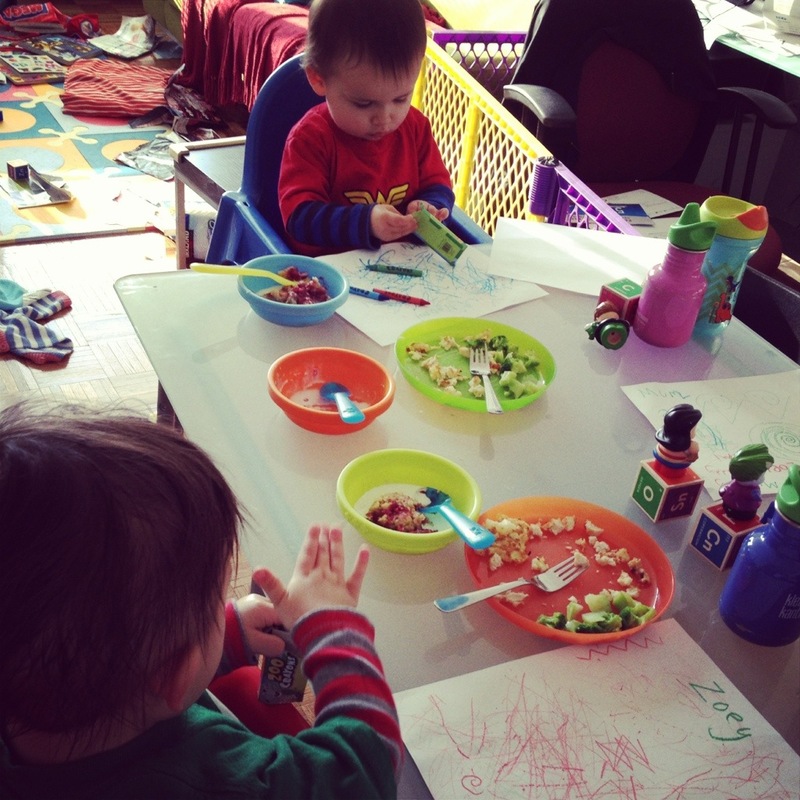 I thought that since feeding toddlers was such a lark I’d write about it. A week in food – such fun! Actually it is, after a year plus of not being able to eat properly I’m now eating three meals a day, and all at a table! Woo hoo. This is the easiest meal as Alex is there to co-wrangle. The showmanship of pouring cereal is still a winner with the girls. First the flakes, then the milk and then we pretend to sprinkle on sugar! Squeee – such fun when you are 17 months old. Gobbled up in seconds. I’ve started making them in mini form on the weekends when we are out and about. Meatballs. Vegetables. Zoey’s nemesis -real food! Okay, she is not that bad she is just particular, and I refuse to turn it into a “thing” so if she doesn’t want to eat something fine. She will taste everything though normally that ends in her wrinkling her nose, and spitting it out. Which is fine. I’m not going to beg her or sprinkle hundreds and thousands (sprinkles) on her mince (ground meat) – this is what my mum did with me. Nor am I going to make something else. Going hungry for a few hours will do her no harm, and it will make her more willing to scoff down the next meal. Needless to say that Naomi munched her way through lunch only stopping to spit out the dried apricots in the stew. Leftovers from breakfast. Win-win for all. Since Zoey didn’t eat lunch I wanted to make supper easy on us all, so I made my go-to mac-and-cheese, or rather Bethenny’s go-to. I’ve made it so often I have the recipe committed to memory and since there is no roux it’s quick. I keep a stash of roasted and pureed butternut squash (measured out in one cup size) in the freezer in ziplock bags (best time saver). Both girls wolfed down their pasta, and Naomi and I ate our broccoli pieces. Naomi really has a taste for broccoli and she eats it out of a little bowl like it’s candy. Which it is! My cheesy biscuits are legendary. Everyone that comes into our family’s orbit knows about the cheesy biscuits. When we are out viewing houses, and I tell our realtor I’ll give the girls a snack to get them through the fourth and fifth house she says to me “Cheesy biscuits!”. I tell everyone about them. Hell, we got through the aftermath of Sandy thanks to the cheesy biscuits! They are one of my go-to-snacks for the Cylonettes, and I bake them at least once or twice a week. They are super simple to make, and happily eaten for days and days. I roll them out on the thick side, and like all cookies whip them out of the oven early (8 minutes on the dot). Roll it out on a floured surface. Not too thin but not too thick somewhere between 1/4″ and 1/2″. After you’ve made them a few times you’ll figure out your preferred thickness. Nigella uses a star cutter but I use a train (as Sheldon likes trains) and I get about 12 train biscuits out of the dough. Bake on a non-stick or greased or lined baking sheet until they begin to puff on top but are hard underneath, about 10 minutes BUT start checking at 8 minutes. Cool completely on a rack and enjoy!